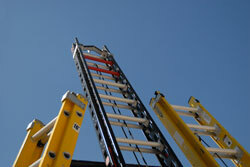 Batavia provides a number of solutions for fiberglass ladders, both proactive and reactive measures. 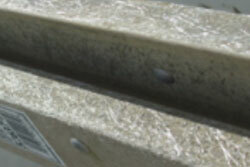 Fiberglass cleaning and sealing to greatly reduce fiber blooming and degradation. Fiberglass degradation or “Blooming” happens when UV and other elements breakdown the veil of protection, and then destroys the resins in the fiberglass. 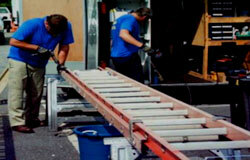 We offer a complete repair solution for damaged and cracked rails. 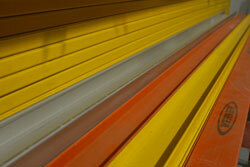 We have an extensive stock of materials to repair most types of fiberglass rails. Removal and replacement of damaged rungs, feet & foot pads, ropes, end caps, lock assemblies and flippers, rivets- nuts & bolts, guide brackets, missing or damaged safety decals, and other components. 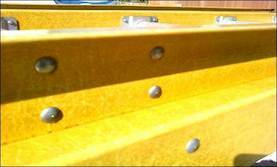 We can also install modifications to improve you ladder's functionality such as: Ladder levelers, V-rung & cable hooks, center point balancing stickers, as well as inside & outside rail wraps.